Is juggling between tasks a headache to you ? Why bother yourself when BOTS can do it for you ! Get updates about your team, and filter them quickly to check what they are working on without leaving Hangouts Chat. All this is possible with BusyOn bot by Botmywork. Using BusyOn bot, you get updates about your team and filter them to quickly to check what they are working on. I want to let you know how to accomplish things using BusyOn bot without leaving Hangouts Chat. It is very useful when you do not need any dedicated heavy system for task management. BusyOn bot works within Hangouts Chat only, so your team members do not need to leave Hangouts Chat for task update. You have a team having many members, especially working from remote locations, they have different time zones. It is difficult for you to track their activity. Using BusyOn bot, they simply update their tasks in the dedicated room in Hangouts Chat. You can just log in to your account in BusyOn web application and check daily activities of the team members based on different filters. You can also view the report on team activities and even download the reports in different formats. Team members not only update their tasks which BusyOn bot tracks, but also can mark their task as complete by entering @busyon done. This helps you view time spent on a specific task. This has many advantages. You get an overview of how much time a team member took to complete a task to make a decision about a team member. Also, you can charge fee from your client on basis of the task time spent easily. 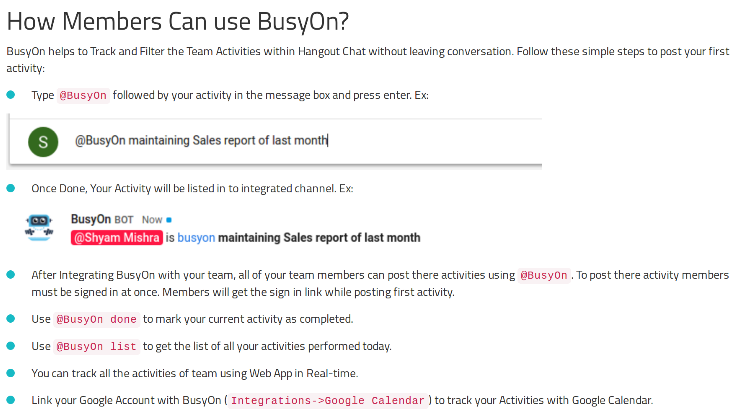 Task tracking in different teams is easier with BusyOn bot. You do not need to login to multiple team accounts in a task management tool. Simply log in to your BusyOn account and from their only, you can switch to different rooms dedicated to different teams in Hangouts Chat. BusyOn dashboard is a dedicated place where you can easily view team activities summary. This will help you to make decisions about your team. Your team members can even integrate their BusyOn account with Google Calendar so that they can see their tasks anytime, even offline. These are few areas where BusyOn bot can be helpful to you without having a heavy task management application for your team. Following STEPS will help you access all functionalities of BusyOn bot and as output, you will be able to increase productivity at your workplace. If you still have issues using BusyOn bot, reply in comments and let me know.